Hunte’s Gardens, located in the lush hills of St. Joseph, was created by a legendary horticulturist with an unusual flair, Anthony Hunte, who is quite the character. The gardens are located in the centre of Barbados’ rain forest, in a sink-hole-like gully, with vigorous plants growing on many levels – from sunny and open spaces, down to a mysterious, dark heart of a real Caribbean jungle. A picturesque and easy-to-walk path offers many surprises, thanks to the superbly created series of mini-gardens embedded within the main large unit, combining vibrant colours and textures of rare exotic plants to offer the visitor a most uplifting and fulfilling experience. Anthony is the heart and soul of this place. 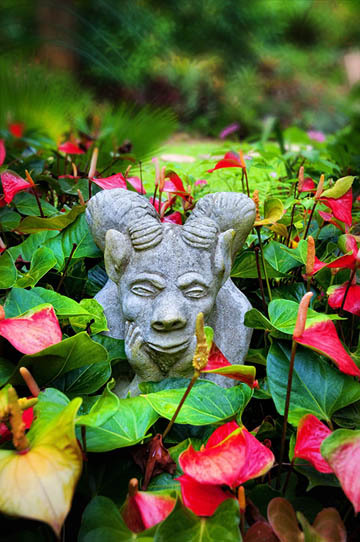 Hopefully you will get to meet him in the gardens or around his extraordinary home (actually converted from an old stable), and you can be sure to be welcomed with fascinating, colourful stories and a glass of rum punch. Be sure to have your camera ready, as birds and animals love to visit this garden too. For the fullest experience, we suggest starting your adventure by exploring the nearby Welchman Hall Gully – a place where you can explore authentic, intact Caribbean rain forest and its caves – and after that coming to Hunte’s Gardens. Hunte’s Gardens is just 20 to 30 minutes’ drive from Holetown, or St. Lawrence Gap, and is not far from the Flower Forest and Orchid World. Admission is Bds$30 and refreshing drinks, fresh juices and rum punch are available. You can also call to discuss a special event (they do host weddings, special celebrations, anniversary parties, artistic photo-shooting sessions, and much more, and can accommodate medium-sized parties in the unusual, Bohemian dining area located directly in the Garden.